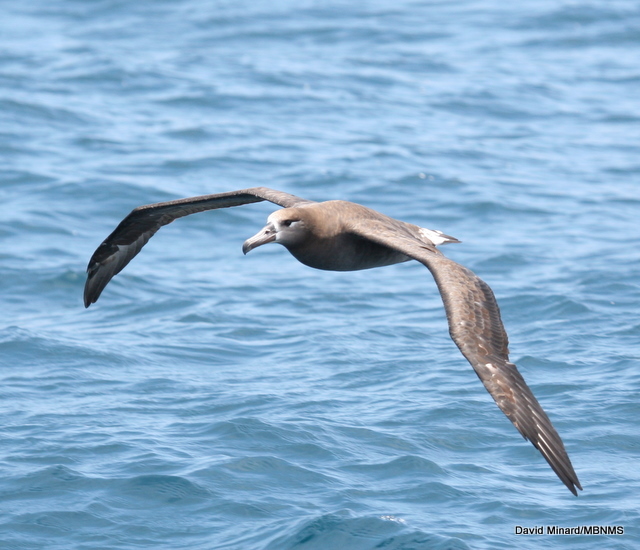 The Black-footed Albatross (scientific name Phoebastria nigripes) is an ocean wanderer that regularly visits Greater Farallones, Cordell Bank and Monterey Bay national marine sanctuaries. If you are lucky enough to catch a glimpse of one, you will be impressed. 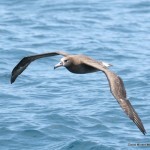 Black-footed Albatrosses can live 40-50 years. They have long narrow wings, reaching six to seven feet from tip to tip. Albatross are monogamous and perform elaborate ‘dances’ with their mate during the breeding season. When incubating an egg, a Black-footed Albatross can go 18 to 38 days without food or water. Both parents care for a single chick from hatching until it fledges, at 140 days old. Albatrosses have a well-developed sense of smell that they use to find flying-fish eggs and squid. Black-footed are the only albatross with all-dark plumage in the North Pacific. Historically Black-footed Albatross populations were nearly devastated by the fashion demands of the early 20th century and other human activity on their remote breeding islands. From the mid-19th to the early 20th century it was highly fashionable to wear extravagant hats decorated with feathers, wings and even whole birds. In 1875, the magazine Harper’s Bazaar described one such hat: “The entire bird is used, and is mounted on wires and springs that permit the head and wings to be moved about in the most natural manner.” The demand for feathered headwear was enormous. By 1886 more than five million birds were harvested annually for the millinery trade in North America. Large albatross feathers were popular, and hunters harvested hundreds of tons of feathers annually—first from Japanese islands and then from Northwestern Hawaiian islands where albatrosses breed. In 1904 Japanese hunters killed 285,000 albatrosses on Lisianski Island in six months, then another 70,000 albatrosses on Laysan Island that same year—just for feathers. All over the world many species of birds were hunted for their plumage, to near extinction. Not everyone was on board with this fashion trend. Two women in Boston, Harriet Lawrence Hemenway and Minna B. Hall, were appalled at rapidly declining bird populations and organized to halt this practice. Along with William Brewster, they formed the beginning of the Massachusetts Audubon Society, which lead to the larger national organization that is still dedicated to birds and conservation. 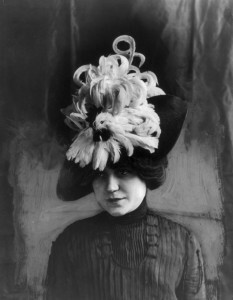 The Audubon Society members and others pushed for legislation to halt the devastating collection of birds for fashion resulting in several Acts 1900-1918 (Lacey Act, Weeks-McLean Law and the Migratory Bird Treaty Act) which clamped down on practices of harvesting and transporting feathers and birds. Once the feather trade subsided other types of human activity impacted albatross breeding islands. Midway is a remote Pacific island and a breeding site for Black-footed Albatross. It also became important to human activity in the Pacific. In 1903 the first trans-Pacific telegraph cable was laid from San Francisco to Honolulu to Midway, then on to Guam and Manila. Construction on the islands impacted breeding areas. In 1935, only 32 years after the Wright brothers’ first flight, Pan Am began trans-Pacific air travel between San Francisco and Macau. Midway was one of the stopovers in the 8,210 mile journey. An airstrip, housing, supplies, and mechanics were all set up on Midway to support the China Clipper’s route. Around 1943 rats made it to Midway and ate Albatross eggs and chicks. During World War II Midway became an important outpost. The construction work to build the facilities that would house 15,000 people, by 1945 had destroyed nesting habitat and literally ran over birds in the process. More birds were culled intentionally for the safety of aircraft operations. 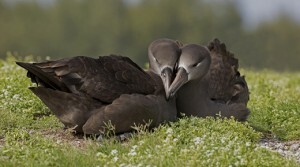 Today there are still threats to the Black-footed Albatross population. Albatross are well-known for mistaking floating plastic for food and feeding it to their chicks, leaving little room for real food. 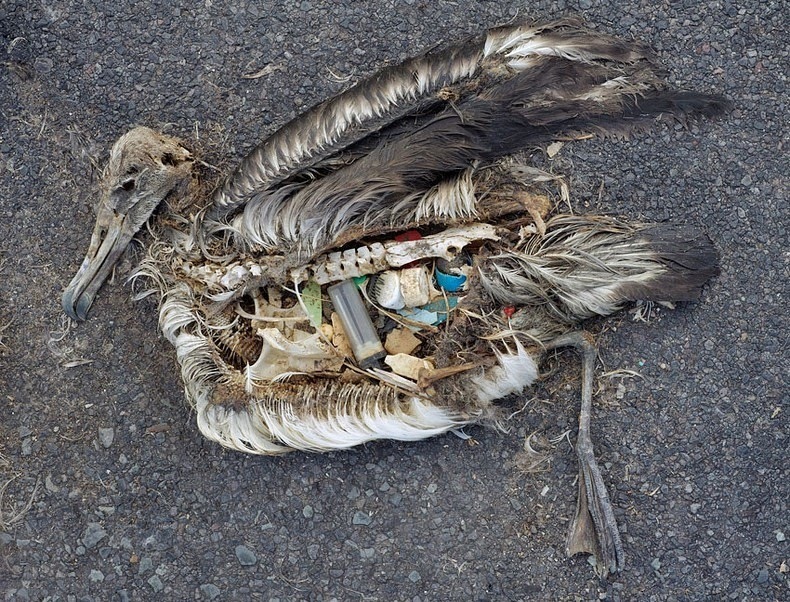 In addition, albatross and other seabirds are vulnerable to long-line and gillnet fishing mortality, oil pollution and chemical contaminants in the environment, including DDT and PCBs. However, island restoration and the removal of invasive rats, cats, and other animals have improved habitat and breeding success on some outer Hawaiian islands.